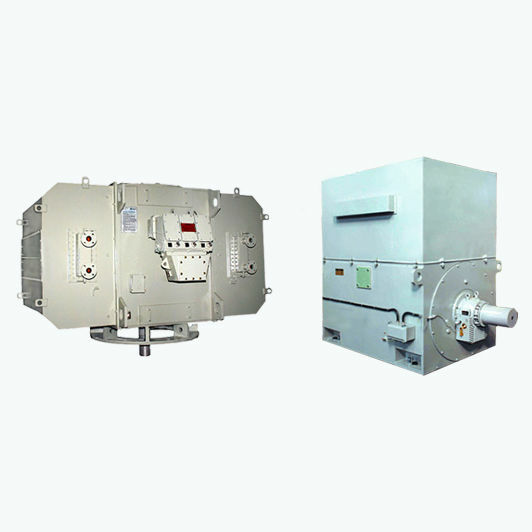 CG offers CACW Motors which include UW and FR Series High Voltage Induction Motors. The UW range of induction motors includes both the Squirrel Cage (i.e. UWC) and the Slip Ring (i.e. UWR) type motors. These motors have totally enclosed construction. The UWC range consist of foot mounted (IMB3) machines which conforms to IS: 2253 / IEC: 60034-7. These motors are totally enclosed with IP55 protection as per IS: 4691 / IEC: 60034-5 and self cooled with air to water IC: 8AIW7- IEC: 60034-6 heat exchangers. The VUWC range is a variant of the UWC range with IMV1 flange mounted construction complying with IEC 60034-5. The UWR range of induction motors is the Slip Ring motor design. The UW range of motors has been designed to meet diversified application demands, while maintaining excellent performance and highest quality. The FR range of induction motor includes the FRC/FRCV type Squirrel Cage motor and the FRA/FRAV type Slip Ring motors. The FRC/FRA type is horizontal and foot mounted (IM B3, IEC60034-7) machines, whereas FRCV/FRAV type is vertical and flange mounted (IM V1, IEC 60034-7).These motors are totally enclosed (IP 54, IEC 60034-5), self cooled with air-to-water heat exchanger (IC 81 W7, IEC 34-6).